We are on to Day 5 of Cassia Denner’s 10 Day Photography Challenge, with today’s theme being “Something I bought”. I have to admit I had no time to be overly creative today, with the job that pays the bills kept my away from my camera all day. But I decided to enter this quick iPhone shot of one of my photo book shelfs, together with a little message that is important to me. No new camera will make you a better photographer. It might increase your motivation to go out shoot more for a little while, bring out a temporary boost in creativity, but eventually the thrill of the new gear will wear off. It always does. Studying the work of the masters will make you a better photographer. Also studying the theoretical and technical aspects of photography. There is so much to learn and understand about photography. I’ve bought many pieces of gear that I rarely use, but I have never regretted investing in photography books. It just is an enriching experience to sit with a photography book and a good cup of coffee, study and reflect on it. Thinking about this Day 5 task also inspires me to compile a list of my photography books I own and treasure. I just need a bit time to do it. So look for it on the Streets of Nuremberg and in my free Learning Center, where you find all my tips and inspirations around photography. Thanks, Olga, I’m just passing on my own experiences 🙂 ! My greatest value of something I bought (buying each month) is my subscriptions to Sue Bryce Education and Gina Milicia’s Gold Community. And the one thing that I essentially haven’t bought but hold dear to me is time. Time to learn and to grow and time to better myself as a person and a photographer. Thanks for sharing your thoughts! I always look forward to seeing your posts in my email, even though I don’t always commrnt. There is so much to learn , thank you for sharing this info. So which photographer’s work do you enjoy? 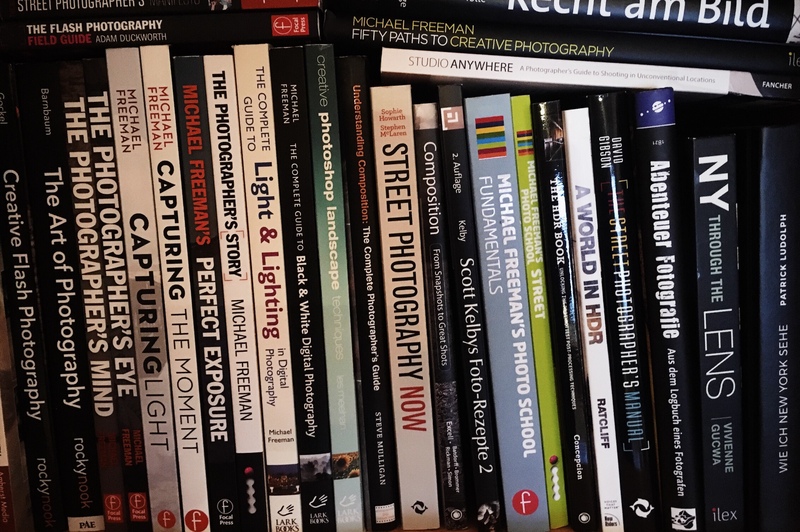 Impressive collection of photography books! I believe knowledge, among other things, inspires creativity.